From left, Frank Barefield, Frank Brocato and Nick Derzis. Journal photo by Ingrid Howard. Hoover Mayor Frank Brocato and other members of the Hoover community attended a groundbreaking April 10 on a new police training facility. 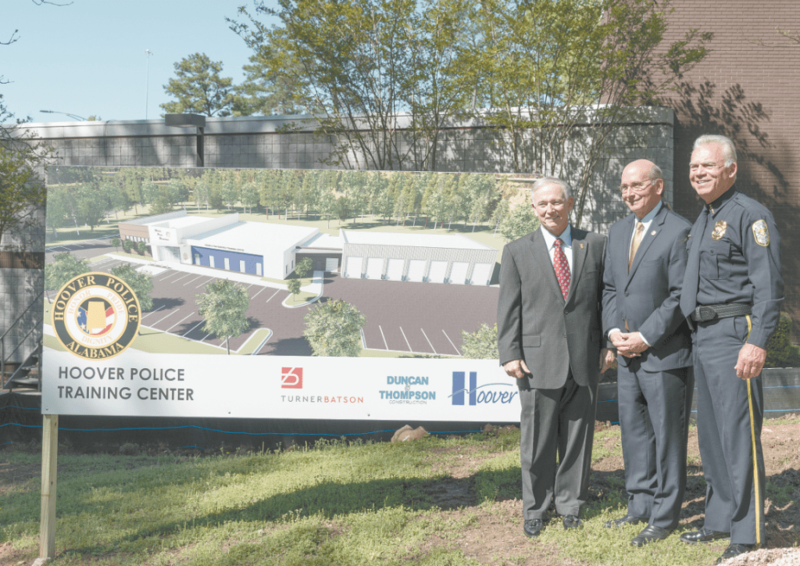 The $4 million facility, next to the Hoover fire station on 800 Municipal Drive, is something police Chief Nick Derzis has been dreaming of for a while. This will be the first time in the city’s more than 50 years of history that it will have a center strictly dedicated for police training. The new center, scheduled to open in early 2020, will be 16,000 square feet and employ cutting-edge technology. One example of this technology is an advanced firearms training simulator called VirTra, which is a video-based, 360-degree platform. Derzis also said he anticipates collaborating with officers from other agencies in the Hoover training center. Brocato said the city was built on public safety and that he is excited for the police department. Derzis spent his time at the podium during the groundbreaking ceremony to talk about his friends, Frank and Pam Barefield. Frank Barefield is the chairman of Crime Stoppers of Metro Alabama. In 2017, his wife passed away after losing her battle with breast cancer. “In honor of his wife, Frank purchased pink badges for all of our officers to wear during breast cancer awareness month to raise awareness for all women who have battled or battle cancer,” Derzis said. When Frank Barefield discovered how much his friend Derzis wanted a training center for the Hoover police officers, Barefield decided to make a huge contribution. Frank Barefield said Hoover has one of the best police departments around. His wife was a good friend to the city for years, Frank Barefield said. So he wanted to do something to honor her, as well. “I know she’s looking at what’s happening today, and I’m sure she’s pleased that she could be a part of it,” he said.